I’ve been writing a lot about magic circles lately, about stories as places you go. The best books and movies are acts of exploration. They invite us in. They ask us to travel. But I haven’t even touched on one of my favorite magic circles of all, yet! Fantasy maps. If stories are places you go, maps are perhaps the most literal manifestation of that. I’ve loved them since I was small. So let’s round out this series with a cartographic survey of the maps that chart the territory of the stories we love. A brief tour of otherworldly realms. A solid, traditional map. The map that launched a thousand fantasy maps. I spent hours tracing Frodo and Sam’s path with my finger, from the Shire, to the Misty Mountains, to Mordor. And though the mountain ranges are a complete mess (the plate tectonics of Middle-earth are…unconventional), it still earns high marks for setting a distinct tone and style through its lettering and line work that carried over even into the movies. I love the way this map feels like a cyclone, a spot-on representation of a world beset by powerful storms that have shaped both the terrain and the creatures that live on it. There’s also something a little ghostly about the way the tails of the cyclone twist around each other, suggestive of the spirit-like spren that are common in Roshar. All in all, a great merging of form and story. At first glance, this map seems a little sparse on details. But you can't really blame the people of the Stillness for not having a complete picture of their territory when civilization effectively ends every couple decades. 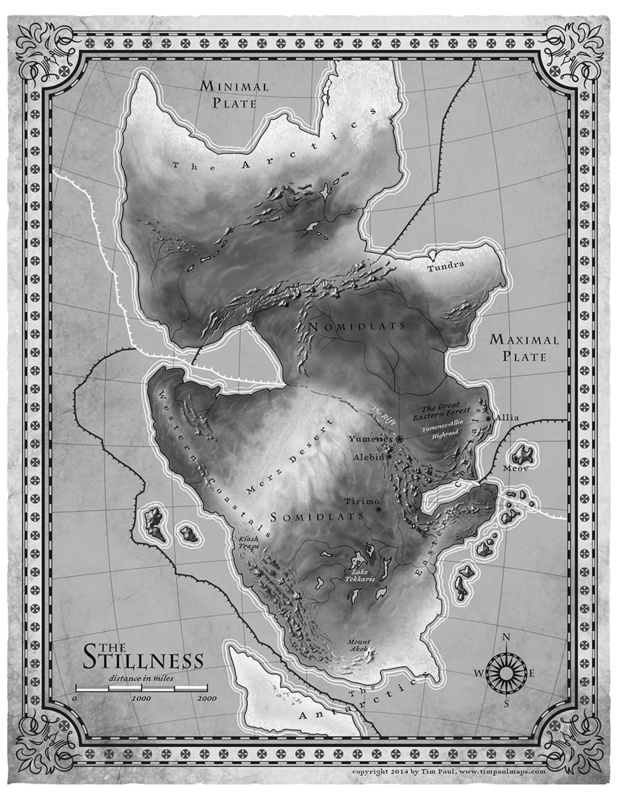 And for a book where the antagonist is the earth itself, the map does well presenting the continent as a broad, massive force of incredible power. So: true to theme, but maybe not so good for navigation. Just as it should be. A common trope in fantasy maps is the part that goes off the edge, where the unexplored lands await. Often, no explanation is given regarding the fact that the world continues on past the area where the Plot happens, but A Song of Ice and Fire is really good at turning this trope into a plot device. There's something up north that’s waiting to be found. And there’s a really good reason it hasn’t been explored. They’ve even built a wall to protect themselves from the edge of the map. A bold attempt to map the language, numbers, symbols, and metaphors we use to convey meaning. By which I basically mean: puns. So many puns. The overly pompous legend is what really makes this map, and the clever wordplay is a great prelude to the book. It’s a little flat and line-y, true, but how can you not admire a map that has the guts to label the areas unimportant to the plot as “More Land”? This map has been redrawn in the years since the book first came out, and the new map made the interesting decision to orient north to the left, instead of up. Though directionally unconventional, I do like it better this way, and I'm pleased the new map kept the best feature of the old one: the tinker and his mule. In both maps, The Great Stone Road is a fantastic detail, a strangely linear touch in the natural landscape that calls to mind travel and old industry in a world that feels very settled. I often return to this map when I need inspiration. I mean, fine, the geography is kind of simple—though it’s supposed to be childlike, an echo of Narnia—but the names are possibly the most dynamic names I've come across on a fantasy map. The Chankly Bore. The Great Bramble. Lower Slosh. It’s largely extracurricular, as the characters never visit these places, but if you have to fill in gaps, you might as well go all out. It offers a pleasant route to adventure, and the eastern docks are nice, but really, the bike path makes no sense, and everyone knows it. You will always have my nostalgia, Pokemon, but I’m afraid you're a tad illogical. The map more than makes up for it, though, with its vast wilderness and color-themed names. The wonderful thing about Hyrule is that there is no one true map of Hyrule. From A Link to the Past to Ocarina of Time to Breath of the Wild, it changes, reorganizes, and inverts every time. In a way, though, that captures the theme of the series to a T. A legend retold time and time again, the details of the adventure different with each game, but the broad strokes of heroism and adventure connecting them all. 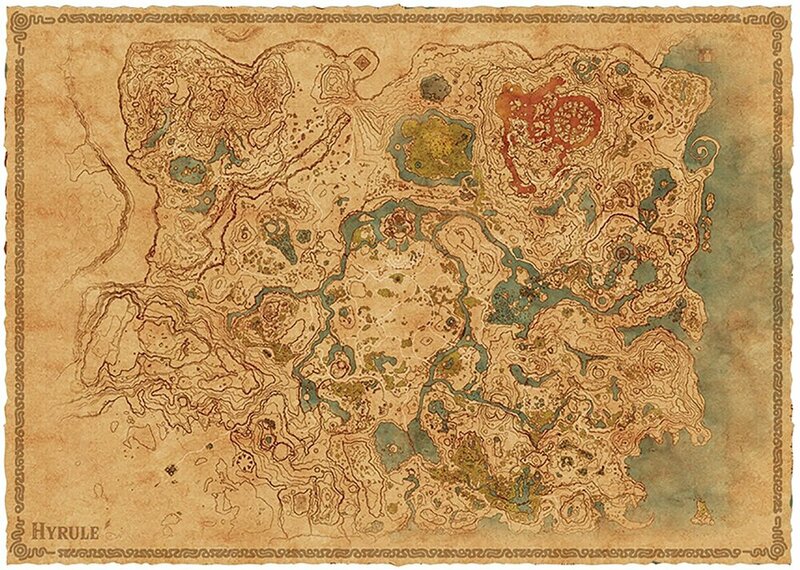 The real map of Hyrule is the one in our heads, formed from bits and pieces of a hundred legends layered one on top of the other. My friend Alex Vitti made this map for Go Forth, and I mean, I might be biased, but it is downright beautiful. Since Go Forth is a fantasy story that takes place in a modern setting, we tried to find a way to capture both the old-timey adventure feel of a map like Middle-earth with the techno-neon atmosphere of a futuristic civilization. The shatter lines of the continents are also preeeetty thematic for a story about breaking heroes to build them up. Though I’ve been making efforts to better understand real world geography, there’s something about fantasy maps that sticks in my head far more effectively than actual, Earth-bound locations. Maybe it’s because they come accompanied by a story to act as the glue. © 2018 Connor Unger. All rights reserved.